Loud is the gnashing of teeth and rending of garments in Eugene: the Ducks lost a run-rule shortened game 10-2. Even worse, the loss was to the No. 19 Huskies. From an Oregon perspective, it was an ugly game. Washington scored four unearned runs in an eight-run fourth inning explosion — two of the scores a direct result of Duck errors. Worst of all, Janie Takeda left the game after an outfield collision. According to coach Mike White she may be out one or two weeks. Just before the Pac-12 season started, White stated that his team needed to improve in two areas to be successful: First, although the Ducks have the best pitcher in the conference in Cheridan Hawkins, the rest of the pitching staff needed rise to the same level. Lately, things had been looking up. Pitchers Geri Ann Glasco and Karissa Hovinga had a combined record of 13-1 and were improving every game, but if the defense behind you fumbles the ball, then you’re going to take another loss no matter how well you’re hurling. The second area White highlighted was hitting in the 4-5-6 spots. 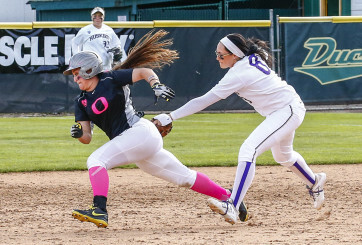 Again prospects looked bright, Hailey Decker — the normal cleanup batter — had banged out a grand slam against Utah Valley and had gone 3-3 for the series. However, in the Huskie loss, Decker went hitless and the batters in the 4-5-6 spots went 2-for-7. 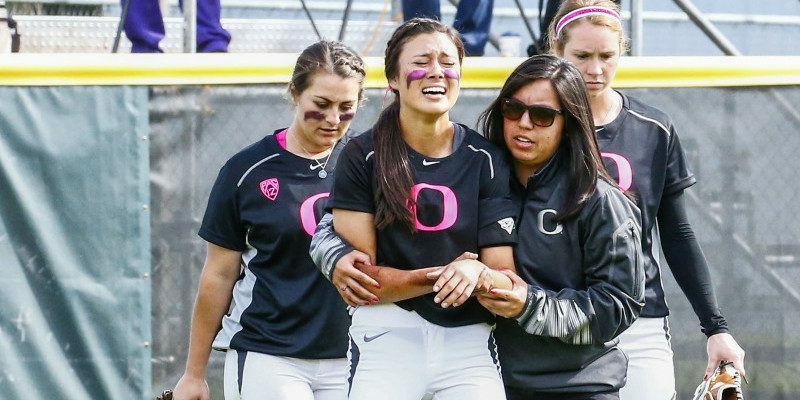 Take heart Duck fans; this is softball. No team can make a run through the Pac-12 gauntlet without a loss. The competition is just too good. Six of the top 25 teams in the nation hail from the Pacific Athletic Conference, as do eight of the last 12 national champions. White will use this loss to motivate his players and pinpoint specific areas for improvement.